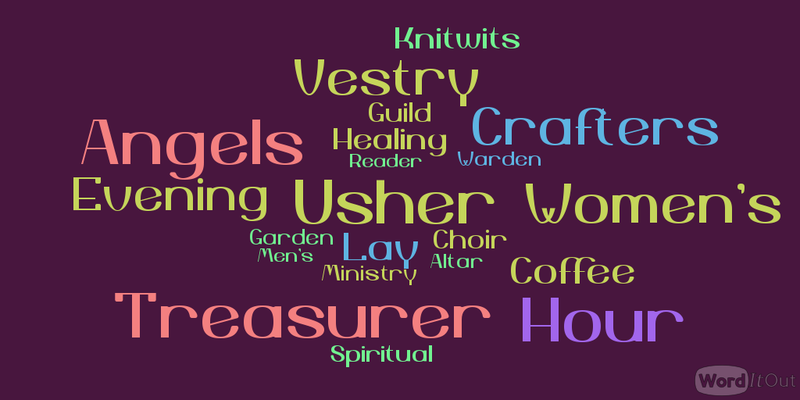 Parish volunteers are a vital part of our church community life, using their talents and gifts to enrich our worship, administer church business and raise funds, to mention a few. It is also an opportunity to deepen your faith, while supporting our worship, helping others or keeping the parish running smoothly. Called “altar-girls-and-boys” by some, Acolytes “serve” clergy at church services. It is they who bear the cross in the Processionals and Recessionals. They bring the Gospel book to the clergy, help during the Offertory, bring water and other hand-washing implements, and bring the water, wine cruets and unconsecrated hosts to the priest. They also light and extinguish candles and perform other tasks as needed. Acolyte ministry is open to all. The Altar Guild is responsible for preparing the altar, flowers and linens needed for all services and holidays of the church. They make sure that the altar brass and gold shine and that the linens are crisp and white. They fill candles, prepare the gifts of the people so that there is adequate wine and bread for the consecration. The guild works in teams of three on a rotating basis, meeting on Saturday morning to set up for Sunday and then cleaning up following two Sunday services. They perform each of these tasks reverently. The choir is an all-volunteer group of parishioners. They provide music for the 10am Sunday service and for many special occasions. They also lead an annual Dickens' Caroling Evening each December. They rehearse at 9:15 Sunday morning before the 10am service. Healing ministers are available to pray with you during communion at St. Luke's Altar. You are welcome to stand or kneel to receive healing prayers. The Healing Ministers will ask you what you would like to pray for, and you may be as specific or general as feels comfortable to you. All information they hear is strictly confidential. After learning of your prayer request – for yourself, someone you love, our community, or the world – the Healing Minister will lay his or her hands on you, pray with you, and anoint your forehead. Lay Readers read the Old and New Testament lessons to the parish and help clergy during services. They also lead the recitation of the Psalm of the day and the Prayers of the People. In addition, they chalice-bear, meaning they bring the chalices of consecrated wine to those at Communion. If Acolytes are not present at a service, they often take on these duties, including Cross-bearing, bringing the wine, water, and hosts to the priest during the Offertory, and snuff candles. Men, women, and youths serve as ushers and greeters at Holy Nativity. They prepare lights, speakers, and heat/cooling systems; welcome people at the door; hand out bulletins; take up the collection; guide or help parishioners who want help to and from their seats and to and from communion; help in many other ways; and assure that the church is neat and clean after each service. An attended nursery is available 9:30 to 11:30 Sundays, except during the summer. Volunteers to help with child care are always appreciated. Pastoral care team coordinates with the Eucharistic Visitors to bring communion to shut-ins, help get transportation for parishioners who need a ride to church, make friendly visits to people at home, visit people in the hospital, nursing homes, rehab centers or other facilities,. We also receive parishioner prayer requests and concerns about others in need. Sunday School Teachers teach the parish youth every Sunday, using use the Episcopal Children’s curriculum as well as having various games and activities that will help us to learn about Christ, our church and being kind to people around us. Coffee Hours Hosts make coffee and tea and provide light refreshments which are served after the 10am service. It is a time to welcome newcomers and enjoy a time of fellowship with others. Study Group From Focus groups about the world we live in to studying books of the Bible or contemporary books, and to groups sharing food and meditation throughout Lent, Holy Nativity’s studying is varied and welcoming to all. The groups offer information and discussion in a non-confrontational manner. A group usually meets Sundays, following coffee hour. Holly Fair Committee Each November, Holy Nativity presents its Holly Fair, known for its varied crafts, food items, silent auction and raffles among other attractions. The Christmas table draws crowds, as do tables for fudge, baked-goods, the country store, hand-made and antique jewelry and a host of other delights. The Friday-to-Saturday weekend event draws to a close on Saturday evening with our legendary turkey dinner with all the trimmings. Garden Angels tend to the needs of flowers, bushes, trees, and other beautiful, outside adornments of Holy Nativity. With the help of the Sexton, members weed, water, trim, and take other necessary measures to keep our church looking its best. Crafters meet Thursdays at 9ish, except during the summer. Everyone pitches in and helps craft items, most of which are sold at the Holly Fair. All are invited, regardless of skill (or non-skill) level. Knitwits meet on intermittent Saturdays at 10am. Those attending sit and share as members knit and practice and share other skills with yarns and other materials. All are invited, regardless of skill (or non-skill) level. Check the calendar for meeting dates! Yoga classes meet on Tuesdays and Thursdays at 4:30pm and Wednesdays at 10am in the Asher Stoddard Hall. The cost per class is $10. Stewardship Committee works year round, taking many forms. Stewardship here is a joyful exchange of Time, Talent and Treasure (or the three T’s as we say). With the understanding that what we have is God’s, stewardship is a way to give back in what ever way we are able. Liturgical Committee assists the clergy in preparing and providing for the spiritual development of the members of the parish through liturgical celebrations and significant prayer experiences by forming and maintaining a vision of liturgy, which is truly the center of the life of the parish. Fun evenings include dinners, music and laughter throughout the year, usually on Saturday evenings.